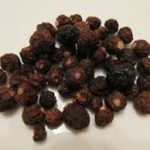 This bush food is also known as the desert raisin because of its appearance when dried, they have been eaten by Aboriginal desert dwellers for centuries and a staple bush tucker. The Anmatyerr women gather them when dried to reduce the level of alkaloids, then grind them to a powder, mix with tree gums or resins and roll into a ball then leave out in the sun to dry. This preserved the bush fruits for future use. 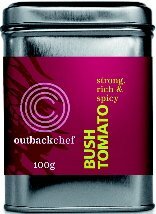 The Bush Tomato has a spicey piquant flavour and can be used to enhance any tomato dish, pasta, pizza or add to a casserole. Bush Tomato is still wild-gathered and is fast becoming a popular bush tucker herb for culinary use in many restaurants. 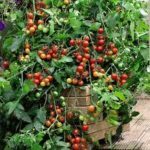 The term bush tomato refers to the fruit or entire plants of certain nightshade (Solanum) speciesnative to the more arid parts of Australia. While they are quite closely related to tomatoes (Solanum lycopersicum), they might be even closer relatives of the eggplant (S. melongena), which they resemble in many details. There are 94 (mostly perennial) natives and 31 (mostly annual) introduced species in Australia. Bush tomato plants are small shrubs whose growth is encouraged by fire and disturbance. The fruit of a number of species have been used as food sources by Aboriginal people in the drier areas of Australia. They have a very strong flavor and scent when ripe and fresh, so that one can actually smell a richly fruiting specimen from quite a distance. A number of Solanum species contain significant levels of solanine and as such are highly poisonous. It is strongly recommended that people unfamiliar with the plant do not experiment with the different species, as differentiating between them can often be difficult. Solanum coactiliferum Aborigines roasted the fruit before eating. Solanum ellipticum Potato Bush, Very similar to S. quadriliculatum which is poisonous. In 1859, the Aborigines were observed burning off the outer skin of S. aviculare as the raw state would blister their mouths. Aborigines eat the fruit of S. centrale raw or put it on the hot earth by the fire, sprinkle some water on the fruits and cover them up to cook them. S. chippendalei is consumed by first splitting the fruit, scraping the centre out and eating the outer flesh as the seeds and surrounding placenta are bitter. S. diversiflorum is roasted before being eaten or dried. Fruit of S.orbiculatum is edible, but the fruit of the large leafed form may be bitter. Fruit of S. phlomoides appears to be edible after the removal of seeds and roasting or sundrying.